Feeling Herbivoracious? Computer software engineer turned blogger Michael Natkin will help you get there with his “feast with the eyes first” plates of vibrant, bold food. Natkin is the Seattle-based computer expert behind the wildly popular Herbivoracious blog that he launched five years ago. 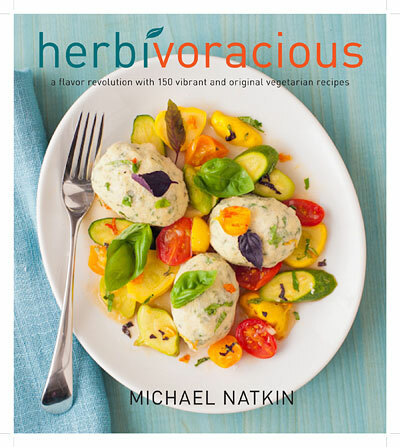 Now, he is celebrating the launch of his hardcover “Herbivoracious” (Harvard Common Press, $24.95) meatless cookbook. Natkin was in San Francisco recently and calmly prepared gorgeous plates of blood orange, parsley and olive salad; sautéed plump grapes with creamy chevre; and a bountiful baked dish of stuffed and baked polenta. Natkin’s cooking and book take a non-preachy approach and give appealing and flavorful options suitable for catered events and everyday meals. See more local coverage of Natkin’s Cookhouse event here, here, and here. Natkin has big plans in his hometown once his book tour winds down. The married father of two is mulling over opening a lunch pop-up that will be what he says is a live way to experience his blog and cooking recipes. Bay Area Bites caught up with Natkin in North Beach and via a telephone interview. What was the turning point that led you to leave your job as a programmer to devote yourself full time to a vegetarian cooking food biz? It’s been a long road and I started the blog at the point in my life where I wasn’t able to leave behind my job yet. I’ve been a really avid cook for 30 years. Many times I thought about making the jump to full-time cooking and took time off work a few times. I lived at Green Gulch farm for months and did the cooking and farming there. I also worked at Cafe Flora in Seattle. The blog has grown, and I now have over a hundred thousand visitors on each month. Harvard Common Press got in touch with me two years ago, and the cookbook project grew from that. My wife and I eventually decided I'd devote myself to cooking and the blog for a few years to see how this will all turn out. Talk about the philosophy that began your pop-up restaurant. What’s your vision for a restaurant? I’ve got an idea to do a restaurant that is almost bringing the blog into the physical world. It will be something different and won’t be for everyone. There’ll be twelve seats or so, and I’ll be writing and testing recipes for the blog. I’ll be open 1-2 hours each day, and diners won’t have a say in what you eat. Hopefully people will find it interesting. I need to find a restaurateur, caterer or event space and create the right situation since I probably won’t want to do it myself. What is the vegetarian food scene like in Seattle and what do you envision your unique contribution to be? It’s a big dynamic scene. We’ve got Cafe Flora, which is world-renowned. They have a lot of comfort food. The area has quite a few Asian vegetarian restaurants as well. My unique spin is to bring a fine dining approach using more modernist techniques. I use detailed plating but it’s very approachable. What you find on the plate will be above and beyond, because I focus on pleasure and not just what’s healthful. The good news is that as a vegetarian, you have a little bit more leeway to eat and enjoy French fries, chocolate and all that. It’s been really fun. Every venue is a new surprise. People have been so generous to offer space and bring their friends. I did a demo in Santa Monica this week, where we walked around the farmers’ market and then brought the produce back and made a Vietnamese menu. What are the most important staples for a pantry to create good veggie-centric meals? One of the nice things about now is that you can shop online no matter where you live. Two sites that I like for ingredients are chefshop.com and amazon.com. Get a really great olive oil, to use for vinaigrettes and when you are ready to really taste the finished dish. Maldon salt as a finishing salt can turn a dish from pretty good to amazing. The smoky flavors in smoked paprika get you the smoky, oaked flavors that can be a little bit hard to achieve in vegetarian food. Dried shiitake mushrooms have a lot of utility and they’re inexpensive. I don’t use them to eat but to make broths. You get the umami flavor. High quality chocolate in the 70% range. It’s really important to look for organic or fair trade. Lately, I’ve been using Valrhona and it’s delicious. You took your own pictures for the book and used the advice of your good friend David Harpe. What are your tips to taking and getting "honest and unadorned" images that make readers want to cook and eat? There’s a few simple things: take your time. Make sure the room is wiped nicely and that things look neat. Use natural light. Backlighting also really works well with food. Stabilize your camera so shutter speeds are slow. If you don’t have a tripod, then brace the camera by using a water glass. Hold glass still, so the image is not blurry. 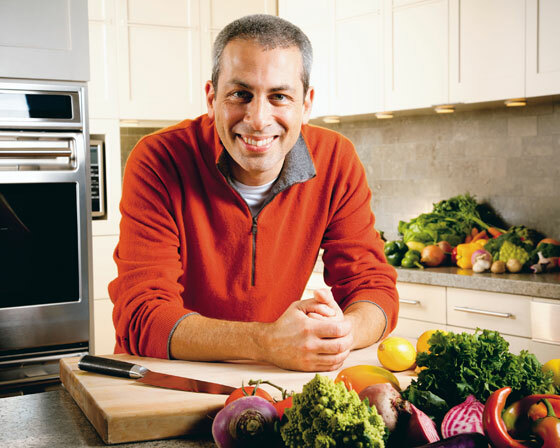 How did you become a vegetarian and interested in vegetarian food? Becoming vegetarian happened almost overnight and there were two causes. I was eighteen, and the happy one was that I had a girlfriend who was vegetarian and a really good cook. I wanted to be a good boyfriend and learned to be vegetarian with her. My mom was dying of breast cancer, and it was a horrible situation. She was on a macrobiotic and was eating 100% vegetarian food. I was willing to cook and help her out, and in the process I quickly became vegetarian. Within one week, I went from eating McDonald’s and I never looked back. Nope, I don't practice Buddhism. I did back in 1986 when I lived at Green Gulch Farm, where there were four sitting sessions a day. I've always had some interest in it, but I can't say it is an active part of my life. Natkin: "Banh mi are Vietnamese sandwiches that have taken the West Coast by storm. They are served on crusty baguettes, spread with a little mayo, and stuffed with pickled vegetables and a filling of your choice. Tofu is usually on the menu, though vegetarians still have to watch out for fish sauce. 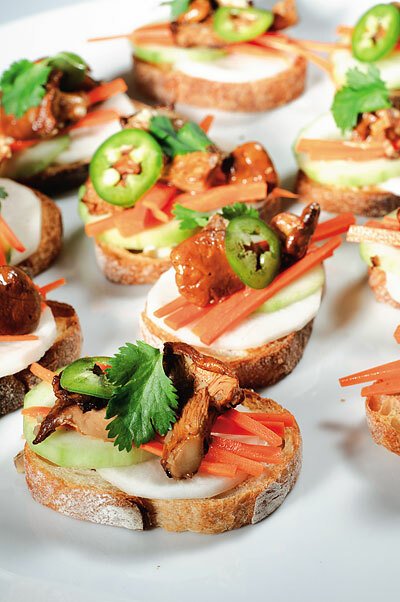 I’ve adapted the traditional banh mi into a little two-bite crostini that makes a great appetizer. It will really wake up your palate with bright flavors and crunchy textures. If you can’t find chanterelle or other wild mushrooms, a thin slab of well-fried tofu would also be delicious, or you could use portobello mushrooms, cut into pieces that will sit nicely atop your baguette slices." 1. For the pickled vegetables: Combine the rice vinegar, sugar, kosher salt, star anise, and a few grinds of black pepper in a small saucepan. Cook over medium heat until the mixture is nearly boiling and the sugar is dissolved. Turn off the heat and stir in the daikon and carrot. Cool to room temperature, then refrigerate for at least 20 minutes or up to 1 day. 2. For the seasoned mayonnaise: Mix together the mayonnaise and hot sauce. 3. To complete the dish: Place a small skillet over medium-high heat. Add the vegetable oil and when it is hot, add the lemongrass, chanterelle mushrooms, and a pinch of kosher salt. Cook, stirring a couple of times, until the mushrooms are tender and lightly browned, about 3 minutes. 4. Toast the baguette slices until very lightly browned. They should still be more soft than crunchy. 5. Spread each piece of baguette with 1 teaspoon of the seasoned mayonnaise. Top with 1 slice of the pickled daikon and 1 slice of cucumber, followed by a few pickled carrots. Top that with 1 mushroom, a sprig of cilantro, a slice of jalapeño, and a few flakes of sea salt. Serve immediately. Mary Ladd is a San Francisco based writer, cook and event pro. She has survived the world’s hottest habañero burger, slaved away at hundreds of events and scurried around the Bay Area with Anthony Bourdain.